Two investors are betting they can make a profit from coal by burning hardly any of it. 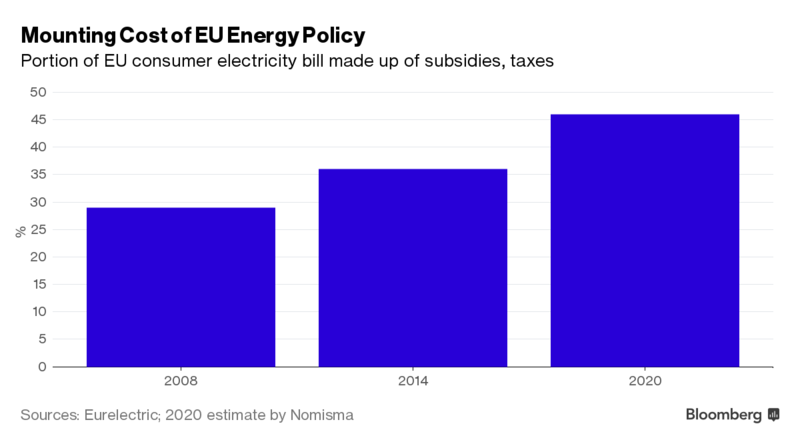 Backup provisions may mean subsidies and taxes will make up almost half of European electricity bills by 2020. Daniel Kretinsky, 40, and Patrik Tkac, 43, are trying to capitalize on Europe’s rapid expansion into renewables by embracing the fuel, a mainstay of European energy before efforts to curb global warming, in its new role as a backup for when the wind dies down and the sun fails to shine. Their Prague-based company bought the U.K’s Eggborough plant in 2014 and last year acquired EON SE’s fossil-fuel stations in Italy. This month, they’ll probably hear if they can take over Vattenfall AB’s German coal-fired facilities. They’ve secured a deal in a U.K. auction where the biggest payout will be about $87 million for keeping a plant on winter standby. Their eventual goal is to get similar backup agreements throughout Europe. Energeticky a Prumyslovy Holding AS’s proposed takeover of Vattenfall’s 8,000-megawatt business will make it the biggest power producer based in the Czech Republic, overtaking government-controlled CEZ AS. Since its inception in 2009, the company, known as EPH, has expanded in the region, operating energy assets from Czech heating utilities and coal-fired plants to German lignite pits and a coal mine in Poland. At the time of the Italian purchase, EPH said its plan was to enter European markets seeking to ensure security of supply. One way is through grid contracts where generators can get paid to keep power capacity in reserve. Eggborough was the biggest U.K. plant that secured a contract to provide reserve power next winter in a tender where the winner got 60 million pounds ($87 million), according to analysis by Sandbag, a London-based environmental group. National Grid Plc, which held the auction, and EPH declined to comment on the contract. If called on, the 46-year-old power station would get about three times the current market price for its electricity, according to the grid manager. On top of that, the plant can pick up 11,513 pounds an hour if required on standby, and another 3,908 pounds an hour for starting. Germany is planning to set up a reserve of stations to ensure supply as the nation exits atomic energy and closes some fossil-fuel generators. The backup would have eight lignite plants, including some of Vattenfall’s, that would be paid to stay offline except in emergencies. EPH isn’t alone in seeking to profit from the need for energy security. Macquarie Group Ltd., the largest infrastructure fund manager, owns U.K. gas-fed stations that it fires up at peak times in the balancing market. The country’s margin of spare capacity would shrink to zero next winter without the backup measures, according to National Grid. EPH will reap benefits as long as European Union members stick with separate national reserve plans, according to Matteo Mazzoni, an analyst at Nomisma Energia Srl in Bologna, Italy. Such backup provisions may mean subsidies and taxes will make up almost half of European electricity bills by 2020, he said. That’s up from about 36 percent now, according to Eurelectric, the utility lobby group.